The “Arab Energy Efficiency Day” is a pan-Arab initiative that aims to raise the awareness of energy efficiency practices and technologies in the Arab region. After the League of Arab States (LAS) conceived the initiative in 2010, by setting strategic goals to enhance Arab cooperation in the fields of transmitting, generating and distributing electricity to save energy, the event became a reality in 2013 when the Arab Ministerial Council for Electricity has set aside May 21 each year as the day for the Arab world to raise awareness about the importance of energy efficiency. On this day Arab energy institutions undertake social events to develop the culture of energy conservation and efficiency in their countries. 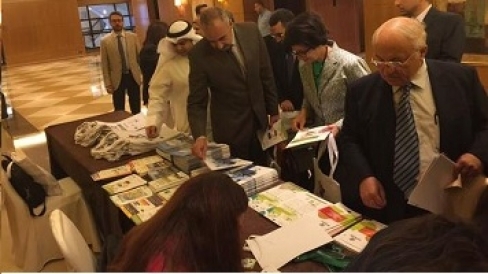 This year, the 3rd Arab Energy Efficiency celebration was held in Beirut, Lebanon on 21 May 2015, at the Mövenpick Hotel. The event was jointly organized by the League of Arab States and the LCEC, and in cooperation with MED-DESIRE as there were 18 attendees representing the project, coming from different regions: a representative of CIEMAT-PSA from Spain, 2 representatives of IAT - Instituto Andaluz de Tecnología from Spain, 2 representatives of AAE - Agencia Andaluza de la Energía de España from Spain, 3 representatives of ARTI - Regional Agency for Technology and Innovation from Italy, 2 representatives of ENEA from Italy, a representative of MATTM/ITALY - TSC from Italy, 2 representatives of ANME from Tunisia, a representative of ECO-Ser from Tunisia, 4 representatives of NREA from Egypt. As per the produced materials, all MED-DESIRE related brochures and customized bags were distributed at the event as well as LCEC brochures, ArabEEDay flyers and nametags. All other marketing materials, backdrop, banners, brochures, and flyers, included the logo of the MED-DESIRE as a main participant and organizer of the event. The official ceremony of the AEED 2015 was held under the patronage of the Secretary General of the League of Arab States Mr. Nabil Al-Arabi and the Lebanese Minister of Energy and Water H.E. Mr. Arthur Nazarian. The opening Ceremony included a speech by the Lebanese Minister of Energy and Water H.E. Mr. Arthur Nazarian, and H.E. Ambassador Mohamed Sobeh, Deputy Secretary General of the Arab Leaque on behalf of H.E. Nabil Al-Arabi, Secretary General of the League of Arab States. The ceremony has witnessed the acknowledgement of three distinguished energy efficiency projects in the Arab World, whereas Lebanon and Palestine co-shared the first prize of the best EE project award. The delivery of the ArabEEday award was followed by a session about the role of civil society organizations in promoting EE in the Arab countries as well as a roundtable discussion between Arab decision makers and media personalities about the role promoting EE, moderated by the famous Lebanese TV Anchor and poet Mr. Zahi Wehbeh. Al-Arabiyya News Channel was the exclusive media sponsor of the event. The day activities that included celebrating Arab countries success stories in the energy efficiency field and discussing the industry’s latest technologies and global initiatives have been a great success especially with the coordination of the MED-DESIRE project representatives that contributed in this fruitful day. Government officials, public sector, and international organization representatives were also invited to the event, as well as Arab energy and power students and professors. The event also included the screening of documentaries and TV commercials promoting EE in different Arab countries that the organizing committee, consisting of MED-DESIRE, LCEC, MED-ENEC and RCREEE, had arranged to produce in order to be used as awareness raising tools. In summary, the event was an occasion to celebrate the Arab countries’ success stories in the energy efficiency field, and the contribution of the MED-DESIRE will be combined to the vast spectrum of challenges facing the Mediterranean region in terms of solar Initiatives and Renewable Energies as part of the promotional activities paradigm related to the legal, regulatory, economic and organizational framework in the energy efficiency field.